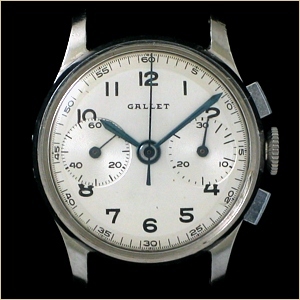 Breaking the gender barrier, the Gallet MultiChron Petite was the smallest wrist chronograph ever produced. Created for enlisted and professional women who before were required to use a gent's watch to do their assigned tasks, the Petite measures only 26.3mm in diameter. Due to the general perception and resistance to "women doing men's jobs", the MultiChron Petite remained as an extremely scarce wristwatch as very few examples were ever produced. 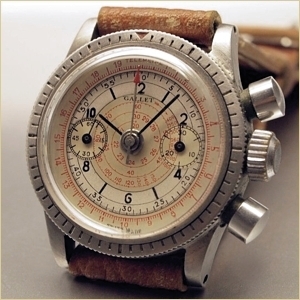 The few existing examples of this extraordinary timepieces are highly valued as rare and important items by today's collectors. 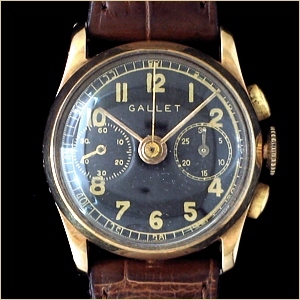 The Gallet MultiChron Petite was a favorite timepiece of the early "Flying Ninety-Nines", the renown organization of women pilots originally presided over by Amelia Earhart. Application: aviation, scientific, artillery timing, etc.